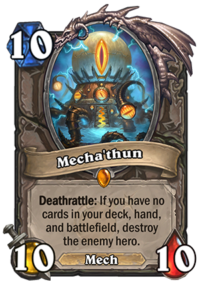 When Mecha'thun was introduced to Hearthstone in The Boomsday Project, it immediately gained a lot of attention. An inevitable, neutral combo card akin the Four Horsemen combo from Uther of the Ebon Blade is a big deal. Any class can have a combo deck! Indeed, people theorycrafted possible Mecha’thun combos for all classes, but some of them are so difficult to pull off that they are not viable in practice. 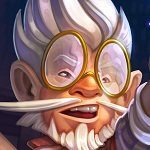 However, the real rise of combo decks did not happen during The Boomsday Project. It happened eventually, though, after the Druid nerfs early in Rastakhan’s Rumble. It is as if the floodgates were suddenly opened, and everyone got a combo deck. This showed up even in Hearthstone tournament meta, as combo decks went on great runs in both Europe and Americas Winter Playoffs. It was not until the Asia-Pacific Winter Playoffs that aggro finally caught up with them and held the line. Combo decks did not rule supreme in the end. Even though their tournament dominance was short-lived, combo decks are still good decks to bring to the ladder, and while Mecha'thun did not end up giving all classes a viable combo deck, there are multiple classes that are able to use it effectively: Mecha’thun Warlock is the powerhouse of the archetype, perhaps unsurprisingly given how you need to empty your deck and Warlock has a Hero Power that draws cards. Mecha’thun Druid is also extremely powerful and fast, and one of the most challenging Hearthstone decks to play of all time, so if you want to challenge yourself while playing the game, it can be a good option. Mecha’thun Priest is a bit out of style, but it is still a powerful deck, especially when it draws an early Hemet, Jungle Hunter to just burn away all the useless cards. For a true enthusiast, Mecha’thun Warrior is also a playable deck, even though it cannot match the power level of its competitors. Four real decks, based around one neutral minion. That’s not bad at all for a build-around card. 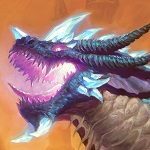 In this article, we take a look at what these decks consist of, how they pull off their combos, and what you can do about it if you meet any of them in the game. We start with the most powerful and most common of them, the infamous Mecha’thun Warlock. The combo part of Mecha’thun Warlock, like all the others, was theorycrafted early. In order to complete the combo as a Warlock, you need to draw your entire deck, but cards in hand and minions on the board do not matter, other than there being enough room to play the Mecha'thun itself and no Deathrattles that would summon new minions for you upon death. You also need to have at least five health remaining. As a preliminary step, you need to discount Mecha'thun to eight mana by playing two copies of Galvanizer at any point of the game when Mecha'thun is in your hand. Then, on the final combo turn, you play Mecha'thun, Bloodbloom (which causes your spells to cost health instead of mana), and Cataclysm, all of which costs ten mana and four health and will discard your remaining hand and destroy all minions. With the deck empty, boom, that’s a win. The evolution of the full deck itself is a different matter. Many of the early Mecha’thun Warlock decks were essentially Control Warlock decks with an added combo win condition – very similar in nature to what early OTK DK Paladin decks used to be like. Voidlord, Bloodreaver Gul'dan, those decks really had some expensive cards in them. However, when you fight against another combo deck, the most important thing is speed. The faster combo deck wins. Therefore, the current Mecha’thun Warlock decks are fast cycle decks, able to draw cards rapidly while defending themselves against aggression and working their way towards the combo turn. Corpsetaker is a central minion in Mecha’thun Warlock, like in so many other decks nowadays. The combination of defensive prowess and Lifesteal makes for a great minion to play in order to stall the game. Cheaty Anklebiter has found a good home in Warlock. It is sometimes used in Even Warlock too, because not only does it provide Corpsetaker with Lifesteal, it can also be used to set up Defile and Lord Godfrey turns and even buff Lesser Amethyst Spellstone by using it to shoot yourself in the face. Acolyte of Pain goes great with Defile as well to really speed up your card draw. The Soularium is also a fantastic card draw tool. That said, because the cards are not permanent, you must be careful not to destroy your combo pieces with it. Do not play it while you have not yet drawn Mecha'thun, Bloodbloom, and Cataclysm, and always make sure you have enough mana to play any Galvanizers you may draw. If you face Mecha’thun Warlock on the ladder, it can be a bit intimidating. The opponent draws tons of cards, plays Taunt minion after Taunt minion, and clears board after board. Mecha’thun Warlock is especially capable of clearing token boards, so a wide board does not ensure success. It has more difficulties against individual large minions – while some variants include Voodoo Doll, not all of them do – so a pair of big threats can go a long way to challenge the archetype. It is also important to note that the Warlock needs five health to pull off the combo: sometimes you can win even when they manage to draw their entire deck, if you can keep them at low enough health. Saronite Taskmaster can sort of counter their combo, but because Warlock does not have to use all cards before the combo, they can usually just kill the Taskmaster, and it only delays them by one turn. If you are really looking for a challenge, and by challenge I mean something difficult to play but ultimately very capable of winning, Mecha’thun Druid is the deck for you. Playing this deck has been one of the most mind-boggling experiences I have had in Hearthstone, and most Hearthstone decks are really not that difficult to play. Mecha’thun Druid’s combo as such is simple: Mecha'thun, Innervate, and Naturalize. Boom, dead Mecha'thun and that’s a win! Or is it? You need to empty your deck, your hand, and your board before you do the combo. Sure, there is some leeway when it comes to the hand, because there are several zero-cost spells in the deck and additional copies of Innervate and Biology Project can even enable you to play other cheap spells, as long as you have targets for them and you can kill off your Mecha'thun with the Naturalize. The real difficulty comes from managing your resources, as there are multiple spells that require minions as their targets, and you need to line up your minions and your removal spells: if you end up with spells without targets or with minions that you cannot kill off, too bad for you. 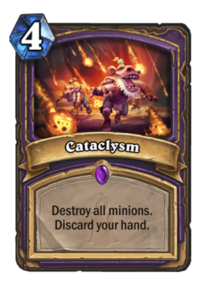 This sounds like an easy task if you’re playing with a deck tracker, but the way you draw cards makes it more complicated: the typical draw turns are heavy cycle turns with either Wild Pyromancer and Acolyte of Pain, or even more commonly with Gadgetzan Auctioneer. 75 seconds, casting around 10 spells, keeping track of everything that comes into hand and is spent with a view to what you have left in the deck and how you need to deal with all of it. It’s not easy. In all fairness, Mecha’thun Druid also faces some stiff competition within its own class. You can simply switch Oaken Summons and Mecha'thun for King Togwaggle and Hakkar, the Soulflayer, and you have a different archetype, one that does not require you to keep such a close eye on all of your resources, but can still win games in much the same fashion otherwise. Other than the huge cycle turns with Gadgetzan Auctioneer, Mecha’thun Druid specializes in board clears with Wild Pyromancer and Barkskin. Combined with some cheap spells, the deck can wipe out a board of five-health minions rather comfortably. Playing against the deck, it is important to keep track of those cards, as once they are gone, the deck can no longer clear wide boards. It does sport some good single-target removal though, because one copy of Naturalize can be spent to clear and there are also Lesser Jasper Spellstones that can be buffed to deal up to six damage each. 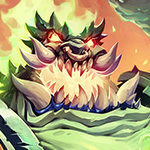 The necessity to clear their own board makes Mecha’thun Druid vulnerable: Saronite Taskmaster and Psychic Scream are ways to give the Druid more minions to worry about, and while a savvy Druid player can play around them to an extent by keeping additional mana gain and removal at hand going into their combo turn, their removal capabilities are not endless. Then there is the matter of Skulking Geist, which can shatter the Druid as long as you have some way to prevent Mecha'thun from dying unsilenced. Being only two cards different from Hakkar Druid makes decisions on ladder very difficult though, as you generally will not know which archetype the Druid player is using until the very last moment. Mecha’thun Priest has somewhat faded away, but it is still a perfectly capable deck. There are two main variants, the Quest version and the regular version. I prefer the Quest variant with Awaken the Makers, because it is much better at defending itself and can often survive a fairly long game before going for the combo. It does so by sacrificing some of its speed though, so if you are in a draw race against another combo deck, you would prefer to mulligan away the Quest. Once again, it is sometimes hard to tell on the ladder. The Mecha'thun combo itself is entirely minion-based: Reckless Experimenter, Coffin Crasher, and double Ticking Abomination when those are the only cards remaining in addition to Mecha'thun. Then just click end turn, and Coffin Crasher will die and summon Mecha'thun from hand, followed by Ticking Abominations dying and killing all of your minions, including Mecha'thun. Boom, that’s a win. The order is important: if Coffin Crasher is not played before the Ticking Abominations, it will not be the first Deathrattle to trigger, and Mecha'thun will not die. There is a small additional complication with the Quest variant. Awaken the Makers itself does not count as being on the battlefield, even though it is on the battlefield. Well, yeah, OK. However, the final combo includes four Deathrattle minions, so if you have an incomplete Quest that is at 3/7 or further, you will get Amara, Warden of Hope during your combo, so your hand will not be empty and your combo will fail. You can play Awaken the Makers late in the game to avoid this, or you can keep it in the mulligan and play it early so that you will complete it long before you get to the combo turn. 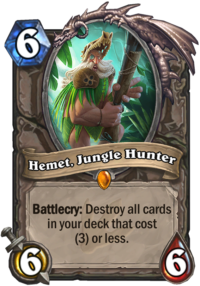 The complications carry on to the use of Hemet, Jungle Hunter. Hemet is an incredibly powerful card in this archetype, as it burns away all of your cheap cards from the deck, and leaves all of your combo pieces intact. An early Hemet is a great way to pull off an early combo. However, if you have played Awaken the Makers, you need to take into account that Hemet will burn all of your Deathrattle minions that are not part of the combo. Therefore, if you leave yourself in a position where your remaining cards advance the Quest to 3/7 or greater, but do not complete it, you will not be able to pull off your combo. Nonetheless, I prefer the Quest variant, because you are much better off taking on Hunters and aggressive Paladins with it than without the Quest, and you still have similar performance available against other combo decks if you mulligan the Quest away – easier said than done on ladder, where you do not know what archetype the opponent is playing. In addition to Hemet, the deck relies on its Deathrattle minions and resummoning them for card draw. Dead Ringer, Loot Hoarder, and Bloodmage Thalnos are absolutely crucial for the deck, as is summoning them back with Twilight's Call. If you cannot find those minions, you are not able to draw effectively. Silencing an early Dead Ringer can sometimes plunge Mecha’thun Priest into chaos, if they cannot find more Deathrattle minions to keep drawing. There is also one rather rare way to counter the combo: Explosive Runes. 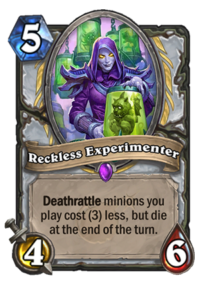 If the Reckless Experimenter dies when played, the Priest does not have enough mana to pull off the combo. This is a rare case of an aggro deck (Secret Odd Mage) having a perfect counter to a combo deck that could otherwise heal up out of reach. Mecha’thun Warrior is probably not the first deck you think of when thinking about Mecha'thun. Granted, it is not as powerful as the three decks discussed above, and it would be hard to climb the ladder with it at high ranks, but it is still a playable deck that does not lose too many games. Warrior’s Mecha’thun combo is The Boomship, which pulls Mecha'thun and Malygos (and optionally a third minion) from hand, after which you play Inner Rage on both Malygos and Mecha'thun, and finish the job with Whirlwind. This clears your board of any minions with six health or less, so your existing board does not matter too much. Of course, both your deck and your hand need to be empty for the combo to work. Warrior has some difficulty incorporating this combo. It is a six-card combo, after all! That’s a lot of dead cards waiting for the finale. Furthermore, that’s no Baku the Mooneater for you, so you cannot benefit from the enhanced Hero Power. This weakens the Warrior’s defensive capabilities and makes it more vulnerable to aggressive decks. There is also only one copy of Brawl in the deck, and you really cannot afford to add another. Brawl can only be played when there are multiple minions on the board, so sometimes you’d want another and sometimes you can’t get rid of it. The opponent cannot completely shut you off by not playing anything though, because Dr. Boom, Mad Genius gives you a variety of Hero Powers, including one to summon three 1/1 minions, perfect targets for Brawl. Nonetheless, if you were to have two copies of Brawl in the deck, you would need to wait too long to get the right Hero Power twice and delay your combo needlessly. As an upside, not being Odd gives the deck access to Warpath, which is a flexible board clear, and to Blood Razor, which can be a powerful tool against tokens. Even without the powered up Hero Power, the defensive capabilities of Warrior cannot be underestimated. Basically, the deck consists of nothing else but the combo, removal, and card draw. 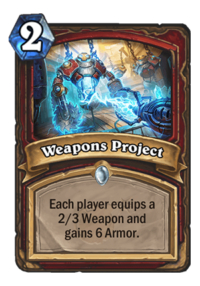 There are some nice card draw tricks that can be done, such as Weapons Project to give the opponent a weapon and then turning that into card draw with Harrison Jones, and playing Acolyte of Pain and Dyn-o-matic on a nearly empty board to draw three cards. 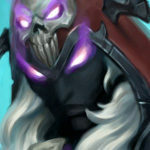 Weapons Project can also be used to remove a nasty weapon from the opponent: Skull of the Man'ari giving you trouble? Just overwrite it! There are several spells in the deck that require a minion for a target, but you can largely rely on Dr. Boom, Mad Genius to provide you with suitable targets. I’ve subjected my poor tokens to Slams, Shield Slams, and Brawls, when the opponent has refused to build a board. Unlike Mecha’thun Druid, Warrior will eventually be able to create its own targets as needed. 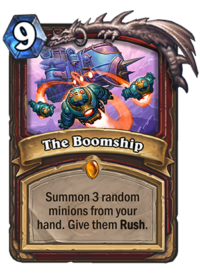 It does not even care about an additional minion in hand, because The Boomship can pull three minions on the board. Alas, a simple Skulking Geist wrecks the entire combo, unless there is a board that you can run your Malygos and Mecha'thun into – they get Rush from The Boomship and can be killed into The Lich King, for example. 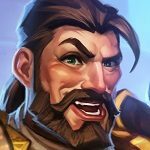 Mecha'thun will remain in the Standard format for another year, so while some of the combo activators may rotate out and new ones come in, it will be there for all classes, waiting for the right support pieces and meta to thrive. There are several viable decks that use it right now, and this tale will continue for some time. What about you? Have you played any interesting Mecha’thun decks lately? How have you done with them? Let me know in the comments! I packed Mecha’thun from an Arena run last week, and got really excited to create a deck to test it out, but then I learned that nearly every combo card are Epics from sets that rotate out in a couple months. I just don’t see the value in crafting all the parts I am missing unless there are some budget options available. Any recommendations? I’m sitting on 3.5K dust, but I’m nervous to invest it when I really just want to be ready for the new Meta in April. Mecha’thun Druid is as close as you can get to a budget Mecha’thun deck, it is far cheaper than the other alternatives. It’s a really hard deck to play, but it is very strong in the right hands. 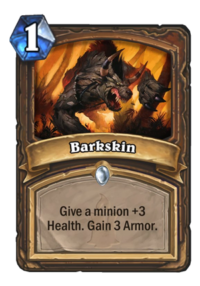 It will lose Barkskin in the rotation, which will hurt its Wild Pyromancer clears a lot, but the main combo itself will remain intact at least. As you already have Mecha’thun, it’s only 2200 more dust, even if you have none of the other cards. If you want to save a little, you can substitute a second Oaken Summons for one of the Branching Paths, that saves 360 dust for a small performance hit, so it will only cost 1840 dust to get started with it, and four of the rares are from Classic set, too. Obviously, crafting things this close to rotation can be scary, but the Druid deck might be a reasonable craft, as it does not leave you completely broke in the game. Really great feedback, thank you! I’m not interested in the deck but your reply deserves some praise. Great reply! Honestly, the druid deck above is relatively cheap and the only epics are the 2 Branching Paths, which are usually used for card draw rather than armor. If you’re still hesitant, you could try substituting in a card draw of your choice (e.g., loot hoarder, novice engineer, bloodmage, etc) and feel that out before pulling the trigger. Branching Paths is so good, because it can be used as draw vs Control OR Armor vs Aggro when you need it, other cards sadly don’t have the same appeal. Another issue is that playing a small card draw minion like Novice Engineer or Loot Hoarder in the late game can be risky, since you also need a way to kill it off yourself. A good player would just leave it there on empty board (1/1 or 2/1 is not threatening anwyay) and make your Mecha’thun combo useless. Plus it makes your Oaken Summons worse. Thalnos is the only one I’d consider because the Spell Damage can be useful sometimes. But then again, it’s not really a “budget” option if someone doesn’t already have it. I would probably rather go for a second Oaken Summons and a Claw as the replacements. 2nd Oaken Summon is obvious, since it both thins your deck and gains Armor (so has similar use to Branching Paths) and Claw for the sake of Auctioneer/Pyromancer synergies. I said I packed Mecha from Arena, but I confused that with the 30 Pack deal that Blizz started offering last week. Derp.